Have You Heard Of Black Cannabis? Here’s all you need to know about why some strains turn black and why black cannabis is awesome. Have you heard of black cannabis? Browse any cannabis forum and you’ll get conflicting reports on black cannabis. Is it possible for some strains to become so dark they look black? While comparatively rare, black cannabis strains do exist. Yet, the deep black/purple/blue coloring only shows up under certain conditions. Here’s what causes some cannabis strains to turn black. Why do some plants get dark? Color changes in plants largely depend on climate. Cannabis plants grown in warm, Mediterranean climates tend to be bright green in color. Plants that are grown in cooler climates, however, begin to produce compounds that turn them purple. The compounds behind this phenomena are anthocyanins, which act as natural antifreeze for the herb. This antifreeze helps the plant retain water, which escapes the leaves as it forms ice crystals between leaf cells. The cooler the grow climate, the more anthocyanin you’re going to get. Other researchers have proposed that anthocyanins can be a form of sunscreen for the plant, protecting leaves from certain intensities of light and making it easier absorb other types of light. Anthocyanins encourage plants to absorb blue and green light wavelengths. Basically, cannabis produces more anthocyanins in response to certain kinds of stress. It’s also likely that the color might attract certain pollinators while deterring other pests. Just like other flowers come in a variety of colors, cannabis flowers are capable of producing a wide range of hues. Plants experiencing drought also tend to amp up their anthocyanins. All of these theories suggest that anthocyanin production is a characteristic that helps plants better adapt and survive in specific environments. If anthocyanin explains why cannabis is purple, where does black come in? Well, anthocyanin in cannabis is the same compound found in plants like black rice, eggplant, black currants, and black/blue tomatoes. So, the more anthocyanin a plant has, the deeper the color will become. Environmental conditions and genetics interact with one another to regulate color. Cool climates stimulate your plants to create more anthocyanin, yet some strains are better able to create this compound than others. For example, certain strains like Black produce deep purple, nearly black leaves and buds, in almost any environment. The theory is that this particular strain has a recessive phenotype that allows it to better convert glucose into anthocyanins. Hybrids from the Black strain can generate a wide range of colors, from purple to reddish and even white. For offspring to remain black, they would need to inherit a recessive gene from each parent plant. Anthocyanins are the compounds which create red, purple, blue, and black hues. However, pH plays a major role in whether or not these compounds cause a lighter red/pink color or a dark, nearly black color. 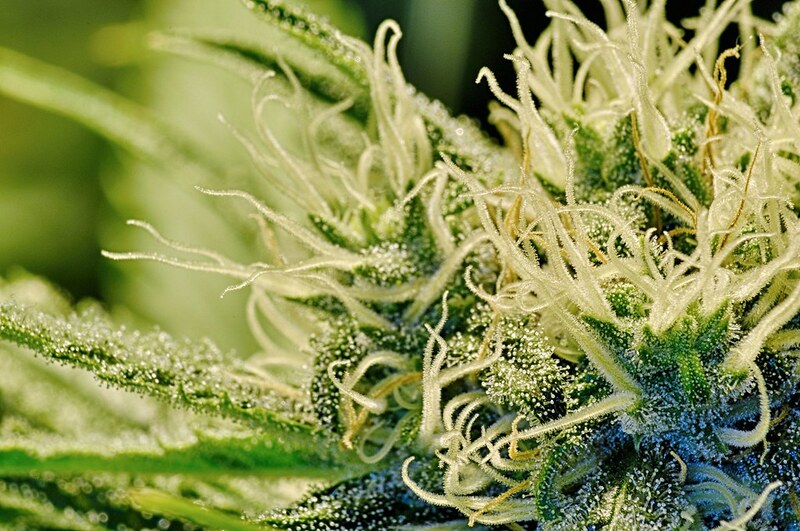 Cannabis plants naturally like soil that’s a little acidic. The more acidic the soil, however, the redder your plants are going to get. Blue and purple colors come out in soil with a more neutral pH. So, looking to bring out more purple in your herb? Keep the pH on the high end of the optimal range, which is 5.8 to 6.8 or so on the pH scale. Does color affect the high? Some people find that black strains tend to be extremely psychedelic and laden with THC. However, the color of the plant may not contribute directly to the potency. Rather, certain strains with black phenotypes may have been selectively bred to also produce high amounts of THC. Indica plants, for example, tend to turn purple more easily and are also thought to naturally produce higher amounts of THC. While color may or may not affect the overall consumption experience, anthocyanins do have a wide range of health benefits. You’ve probably heard the expression “eat the rainbow”. So, looking to create black cannabis? Start with a strain known to produce black phenotypes. Put it under intense light and keep the growing environment nice and cool. Make sure your pH is closer to neutral while still in the optimal pH for cannabis cultivation. Do not overwater. To keep the black going, avoid hybridization with a non-black strain. Your plants will likely begin to express their color during flowering as the herb ages.